Alleppey Backwaters - Enjoy Venice of India in Alleppy back water tour. 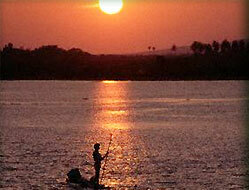 Alleppey (Alappuzha) is prominent on the tourist trail as it is one of the major centers for backwater boat trips. 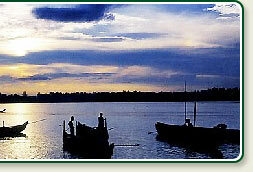 With Arabian sea on the west, Alappuzha has a large network of lakes, lagoons and several freshwater rivers intersections. Alappuzha has grown in importance as a backwater tourist center, attracting several thousands of foreign tourists every year who come here to enjoy the serene marine beauty of the state. 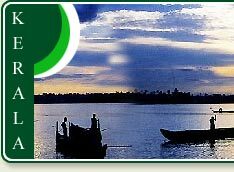 Boat races, houseboat holidays, beaches, marine products and coir industry are some of the major attractions offered by Alappuzha. 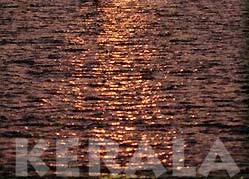 Water Sports: Tourists can participate in numerous beach activities offered on the beautiful Alappuzha beach. For instance, you could indulge in any of the exciting water sports such as surfing or parasailing, or go swimming in the clear blue sea, or even try your hand at building a sand castle or playing a game of beach volleyball. Boat Races: It is held in the months of August and September when the earth is moist and rain-drenched and the glorious backwaters overflows. Hundreds of men and women gather on the banks to witness a spectacular view especially, the Snake Boat Races. The most famous event of boat race is the "Nehru Trophy Boat Race". It is held on the second saturday of every August. There are a dozen other snake boat races, providing an unforgettable and truly special scene. The fund of energy, spirit of competition and unerring co-ordination makes this sport extremely dynamic. Kuttanad: Kuttanad, called the rice bowl of Kerala, because of her wealth of paddy crops is at the very heart of the backwaters. The scenic countryside of Kuttanad with its shimmering waterways also has a rich crop of bananas. Krishnapuram Palace: The 18th century Krishnapuram Palace built during the reign of the Travancore monarch, Marthanda Varma, is a double storied structure which displays typical characteristics of Kerala architecture-gabled roofs, dormer windows, narrow corridors. Ambalappuzha (Pilgrim Center): The Sri Krishna Temple at Ambalapuzha, 14 kms from Alleppey is among Kerala's more famous ones boasting of the typical temple architectural style of the state. Pathiramanal: 14 kilometers from Alleppy, this little island on the backwaters is a favorite haunt of hundreds of rare migratory birds from different parts of the world.